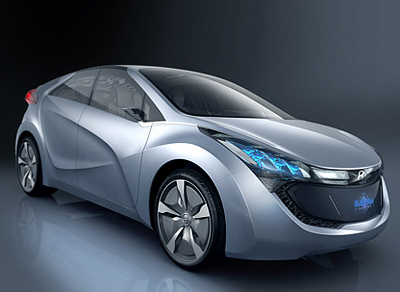 The Hyundai Blue-Will is a plug-in rechargeable hybrid powered concept which uses an all-aluminium Gasoline Direct Injected 1.6-litre engine coupled to a CVT (Continuously Variable Transmission) and a 100kw electric motor for propulsion. The Lithium Ion Polymer battery pack is located near the fuel tank under the rear seat to maximize luggage space. To help top up the power levels in the battery pack the Blue-Will is equipped with solar panels stylishly integrated into the roof panels and rear window. 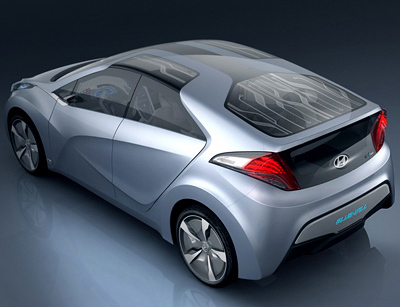 Aside from the power source the Hyundai Blue-Will concept also utilizes recycled materials to help reduce its impact on the environment. The headlight bezels were formed from recycled plastic drinks bottles, while the interior features numerous components which are made using Polylactide acid (PLA) plastics. PLA is a plastic produced from cane sugar or corn starch and has the benefit of being both easily processed and manufactured while also being biodegradable at the end of its lifespan. The Blue-Will also uses components made from PA 11 plastic, this compound, while not biodegradable requires less energy during production than standard plastics. 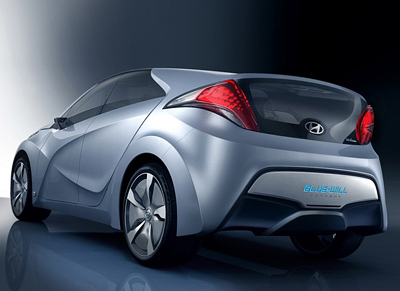 The exterior design of the Hyundai Blue-Will is both futuristic and at the same time feasible for production. The crisp styling lines which intersect on the front door define the overall style of the vehicle and lend the concept an almost Seat-like styling quality.